Chances are you can't name a single central banker from the 1920s, but in their day, they were quite the celebrities, even giving false names when traveling by ocean liner in order to dodge the press. These were the men who  in the wake of WW I and the economic destruction it wrought  returned the world to the gold standard, used interest rates to bolster the value of currencies and let stock speculation run rampant. 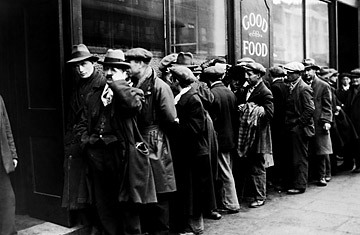 In short, they helped lay the groundwork for the Great Depression. In Lords of Finance: The Bankers Who Broke the World, investment manager Liaquat Ahamed tells the story of these men  a tale with plenty to resonate with today's economic malaise. TIME's Barbara Kiviat spoke with him. Who were these people, these members of what newspapers dubbed the "most exclusive club in the world"? The second figure was the head of the New York Fed, Benjamin Strong. He was part of a generation of American bankers who were disciples of J.P. Morgan. After the First World War he realized the U.S. was in a position to exert an enormous influence on world financial matters, but he had quite a tragic life. He contracted tuberculosis, and this was before antibiotics. They thought the cure was thin, cold air, so he spent months at a time in the mountains of Colorado while trying to manage the world economy. He died in 1928. The third character was the German, Hjalmar Schacht. He was brilliant, arrogant but completely opportunistic. He was obsessed by the fact that reparations [that Germany had to pay to the Allies after the war] were unfair. He captured the mood of Germany very well. He presided over the economic miracle during the Weimar years, which was built on a lot of borrowed money. In 1930, when it was clear that Germany was going to go through the wringer, he resigned. Many people believe he realized Germany was doomed and that he did not want to be blamed for it. The final figure was Émile Moreau of the Banque de France. The others were bankers, but he was a civil servant. He was the mayor of his little town for 35 years, and that captures his character  a rural Frenchman, he could have come out of a novel by Flaubert. Insular, xenophobic, he refused to learn English and believed, somewhat justifiably, that international finance was an Anglo-Saxon conspiracy designed to exclude France. Telling the story through these four central bankers was a way of highlighting the fact that critical policy decisions are made by individuals, not abstract committees. They had choices. Reading your book made me feel a lot better about our economy and policymakers today. Well, we're not going to make the same mistakes. We're not going to let the banking system collapse; nor is anyone going to impale their economy on a fixed exchange rate; nor are we going to raise taxes in the middle of the depression. And we do have the IMF keeping international credit moving. The one big worry is that in the 1920s, the banking system in the U.S. was about $50 billion, which was about 50% of GDP. The banking system and the shadow banking system now are about 150% of GDP. In Britain it's 350% of GDP. The worry is that the financial system has become so large relative to the size of central banks that we've created something of a Frankenstein. No one really knows whether we can handle a financial system that's 150% or 200% of GDP. You mean that monetary policy isn't up to the task? I think we now know that monetary policy has lost all traction. We're putting our faith in fiscal policy. Why do you say lost all traction? Because interest rates are at zero. We've injected all this money into the banking system and banks have lost so much capital that their inclination is to hoard capital. It's going to be very hard to get it out the other end. That happened in 1932. By 1932, the Fed finally realized it had to do something, and there was a very large open-market operation  basically, buying bonds  and recapitalization of the banking system, and that stopped the run on the banks temporarily, but credit continued to decline. So what do you make of how our current economic crisis is being handled? I suppose the one thing is, thank God for Larry Summers, in the following sense: when monetary policy has lost all traction, then your only hope is fiscal policy. The danger with fiscal policy is that they'd do too little, because we've spent the last umpteen years saying we've got to keep our deficit under control. This is not the time to worry about that. Until [Summers] came along, I was struck by how modest all of the stimulus packages everyone was talking about were. He's sort of the [John] Maynard Keynes of today. He says go for it  let's spend $600, $700 billion a year. To what extent do you think it's possible to prevent financial collapse  as opposed to just dealing with it after it arrives? In 1926, the central bankers in your book were already worrying about many of the things that would eventually lead to the Great Depression. They saw it coming but didn't stop it. The odd thing about the central bankers of the time is that you read their letters to each other, and they really were very worried in a way; I don't think Greenspan was worried enough two years ago. But they had these intellectual blinders on and basically were so rigidly tied to the gold standard that they had almost given up almost all degrees of freedom. They didn't do anything but agonize. And I do think it's possible to worry and then figure out what to do. We're learning a whole series of lessons now, like you don't want to create shadow banking systems without enough capital. The idea that we should do nothing about bubbles because of this Greenspan notion that we can never figure out the difference between an asset-price increase that is fundamentally driven vs. one that's a bubble, I think, has been completely discredited. Everyone now says we should act preemptively against bubbles. If we didn't learn that lesson from the run-up in the stock market before the Depression, is there any reason to believe we'll remember it the next time around? I think we'll remember it for another 30 years and then maybe forget it. [John Kenneth] Galbraith has this fantastic line where he says you basically have these things every generation. But you need the old generation to die off and forget the lessons. I also wonder how much power central bankers ultimately have to prevent massive problems like this. You write about how in 1929, when the Fed cracked down on banks lending to brokers selling stock on margin, money flooded in from other sources. Monetary policy is fine for steering the economy while it's on level ground, but the minute you go into a ditch, monetary policy isn't enough to get us out of it. Variation in interest rates is normally an effective way of steering the economy, but then you get into these crises where the whole machine collapses, and all you're doing is pressing on the accelerator and spinning your wheels. I do think there is a wider issue [of] investing so much power in the hands of people like Alan Greenspan and saying, 'We'll just trust you because you said it's O.K.'  I don't think anyone is going to do that for another 50 years, until we forget about this mistake. All of the people who were running central banks allowed the financial system to become so large and leverage to become so pervasive. That they allowed banks in Iceland to become 850% of GDP is crazy. The Royal Bank of Scotland had the largest balance sheet in the world for a while. That made no sense. Central bankers in the 1930s and '40s were not important people. Government basically told them what to do. This whole mystique of, Just give it to this élite group of men to run the world economy  I don't think we're going to allow that to happen again for a while.